Seeking a fast solution to the cellular connectivity problems in their 20,000-square-foot office, STOTZ Equipment contacted WilsonPro dealer BlueCable Networx. From first contact on March 28, 2016, it took just two weeks to complete the installation of a carrier-agnostic WIlsonPro cellular signal booster system, improving signal strength by April 11, 2016. The closer the reading is to 0, the stronger the signal strength is. Today’s businesses count on the reliability of their communications systems for both regular business operations and customer service, which makes consistent cellular connectivity crucial. When connectivity becomes unreliable, businesses are faced with situations that can negatively affect both their bottom line and their reputation. STOTZ Equipment, a farm equipment and tractor dealer in Casa Grande, Arizona, discovered this first hand when they began experiencing poor cellular connectivity and constantly dropped calls. 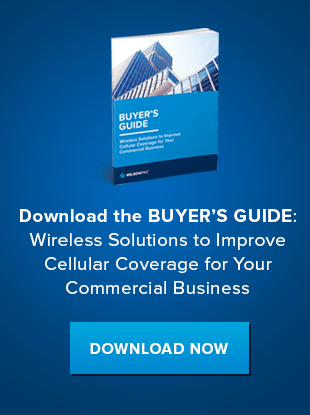 The company knew it needed to quickly find a new cellular solution to improve coverage. STOTZ Equipment was having connectivity problems in their 20,000-foot facility. Dropped calls and spotty service were negatively impacting business operations, productivity and customer service. Employees were struggling to connect with customers and with each other, cutting down on efficiency and risking the reputation of the business. STOTZ Equipment needed a fast solution for this connectivity problem and reached out to WilsonPro dealer BlueCable Networx for an answer. BlueCable identified STOTZ Equipment’s office as a prime candidate for a WilsonPro cellular signal booster system, also known as a passive DAS. In a passive DAS, antennas capture the existing cell signal and route it to an amplifier or booster where it is amplified but otherwise unaltered. Cellular signal boosters can be installed virtually anywhere and work with any provider on 4G LTE data and 3G/2G networks. Ideal for rural or agricultural settings like that of STOTZ Equipment, passive DAS are an efficient way to improve cellular performance. Case Study: Learn how a prominent NYC retailer quickly improved cell signal quality with a WilsonPro booster solution. Not a cell service replacement, signal booster systems use the existing cellular signal and increase its power, creating more reliable service, reducing dropped calls and improving voice quality. Also common in auditoriums, college campuses and transportation networks, these systems are increasingly used in modern, energy-efficient buildings that tend to block cellular signals. By using a signal booster, businesses can harness the cost-saving and eco-friendly benefits of these modern buildings while maintaining reliable cellular communications. Recognizing the need for stable coverage on STOTZ Equipment’s preferred provider, Verizon, BlueCable added a WIlsonPro cellular booster system to optimize coverage in the STOTZ office, providing a higher level of reliability for cellular communications. The bonus of a WilsonPro solution is that its carrier-agnostic product line benefits all users regardless of cell service provider. Within two weeks of initial contact with a WilsonPro dealer, STOTZ Equipment vastly improved cellular performance with their new WilsonPro cellular signal booster system. A turn-key solution customized to STOTZ Equipment’s needs, the new system provided stable, accessible coverage across all carriers, including STOTZ Equipment’s preferred Verizon network. Today, STOTZ Equipment enjoys better connectivity, communications and productivity. Contact us to learn more about how WilsonPro’s certified professional installers can bring better cell signal reception into your home or business.